Real Estate Website Myths: BUSTED! With the return of real estate this past year there have been website companies popping up left and right all offering the “best real estate websites” online. Despite the success of the internet as an advertising platform many real estate professionals still have preconceived notions on what can and cannot be done – much less what should be done – and unfortunately this can cause a lot of myths to be created and a lot of relationships to be destroyed. We here at Tour Real Estate have had a singular focus for over the last decade: providing great, effective, real estate websites. So before lending an ear to the myths you’ve been hearing, or straight up falling prey to some fast talking smoke blower, consider these top real estate website myths and allow us to put your fears at ease. A Website is Going to Change Your Life. Uh, no. We stress this strongly in order to be fully up-front with our potential customers. A website is a tool. Nothing less, nothing more. If you do not use that tool by customizing it to your market, and advertising it to your sphere it is still fully functional but you simply can not expect to see amazing results. Like much else in life you get out of your website what you put IN to your website – this also means leveraging the visibility of your website by social and real world networking. You Are Stuck With the Search MLS Provides. In many systems this is true. It comes in pre-canned, framed in, and fairly awkward. The way we do things here at TourRE is a little different: We take the raw feed from MLS, reformat it, optimize it, and push it out to your website in a dynamic fashion. This allows us to provide custom searches instantly for out clients like: Today’s New Listings, REO Homes, HUD Homes, Searches by City, and just about any other criteria you will find in MLS itself. The Free Site from my Brokerage Is Just as Good. Big no to that. The old adage of you get what you pay for is true! That’s not to say you can’t have a free site and possibly even get some use out of it. A simple, free website is certainly better than no website at all. However we generally caution people to just be aware of what they are (or aren’t) getting as part of that deal. Most freebie websites offer very little customization or control – meaning that to your visitors and to search engines you look exactly like a million other real estate sites out there. What incentive does that give potential client to choose YOU? Having a Website Takes Too Much Time. You’re not a geek, you want to be moving real estate, not punching buttons – we understand that. No website is ever going to be brilliantly effective if you just set it and forget it, but thankfully our websites are very easy to get setup with very minimal effort. Once there the functionality of the site largely takes care of itself – your listings, your offices listing, and the entire MLS is automatically pulled into your site without any effort from you. We still recommend using the large number of additional marketing tools we provide at least once a week; for those who are really interested into taking their online presence to the next level we can gladly provide guidance and consulting. It’s a Nightmare to Get Help. Most other web companies are from out of state, and then have call centers in other countries. To even change your name or contact info you could be waiting weeks to even hear back from a tech. Tour Real Estate is proudly located in Idaho’s beautiful Treasure Valley. Our system allows you to control most every piece of text on your website; if you don’t have the time, or just can’t figure it out our customer service can’t be beat. We reply quickly and resolve issues fast. When you call us you’ll be talking to a real live person who can generally get your request taken care of immediately. We excel at what we do because we care. We excel because we’ve chosen to focus on doing one thing, and doing that one thing very well, for over the last decade. If you’re unhappy with your current real estate web presence – or don’t yet have one – we’d love the chance to talk with you in order to show you how we can help you. Visit our website, or check out any of our social media portals below to find out more! Everyone is coming to realize as more and more websites get online you really must have some way to set yourself apart from the hundreds of millions of other websites online. One way to do this is through social media. Social media provides the most accessible, easy to use, and widest reaching platform for nearly any business model – this includes real estate. We’re glad to see so many Realtors waking from the Field of Dreams marketing mentality and taking interest in seizing their digital destinies. It is for that very reason that we’d like to offer some good general practices for finding more success in your social media efforts. will take time, even months, to really begin to see returns from your efforts. When fans know what to look for they can look forward to it. Use whatever network you like, but use it every day for best results. There is nothing more embarassing than having someone visit your page and see that it hasn’t been updated in months. band probably won’t win you any fans. Providing content that is relevant to your audience is the best way to gain interaction and keep fans coming back. hamburger – make your content 80/20…that is to say 80% positive thoughts, quotes, jokes, pictures, or local interest posts; maybe 20% about real estate or hard marketing your services. People today are bombarded by thousands and thousands of pieces of advertising every day; if you are just one more source of things for sale you will likely be tuned out. Social media is not a silver bullet for all your marketing needs. It will not instantly make your traffic soar or bring in a flood of leads — furthermore that isn’t what it is even about. Social media isn’t about selling to the people you’re connected to, it’s about connecting with the people you’re selling to. It’s about building relationships and establishing trust online. Have questions about how you can benefit from social media? We’re always glad to talk shop! Contact us with your questions and be sure to follow us on our social portals to stay up on the latest news and tips to help you move more real estate! Seems like the new year always brings a fresh round of fast talkers and smoke blowers to the arena of online real estate solutions. 2012 has been no different; while we always welcome a little friendly competition we dd want to make our REALTOR® friends aware of some things that they should be cautious of. If it sounds too good to be true, they are likely trying to sell you something. Some tech companies come in like lions roaring and raging about the effectiveness of their websites in search engines or capturing leads. When this happens, ask them how many of their websites actually show up in the top 20 search results for your market. Find out a good average of traffic for their domains; how many leads generally come in. We Can Make You Number One in Google! Be especially wary of anyone promising to get you to first place in any search engine. Google specifically states that no company can promise any sort of exclusive relationship with them; as search algorithms are always changing no search results can truly be guaranteed. One sneaky tactic is for them to indeed get you to #1 in Google, but not for a phrase anyone is searching for – you see it’s easy to rank for “purple zebra hacksaws” but no one is searching for that; even if they did it certainly wouldn’t help you move real estate. Social Network Marketing is MORE than just Being There. Some companies will charge hundreds of dollars just to setup a twitter or Facebook page. Once their obligation to create them is complete it’s hands off and you’re on your own. JUST having those profiles, and the little icon on your site, does absolutely nothing for you unless you are actively using those sites, and using them in a consistent and effective manner. There’s nothing more sad than visiting a twitter page and seeing “Last Tweet March 2010” or a blog with default text right where it was created. REALTOR® websites from Tour Real Estate are affordable and effective. They are search engine friendly from the start; feature the ability for you to control your content, links, and search engine visibility. We package all the online tools you will need to market your services and showcase your listings. TourRE has been revolutionizing the way real estate is found for over 10 years, we are a local Idaho technology solutions provider; our customer service and loyalty is unparalleled. Too busy to blog? Too tired to tweet? We can provide cost effective REALTOR® search engine optimization and social network management. We are even glad to help you learn more about using the profiles you may already have so that you can take control of your digital presence all on your own. Already a TourRE client and want to make more of your site? We’re glad to help out!Contact us so we can discuss how you can improve your online visibility and gain more traffic in 2012! Not a TourRE client? What are you waiting for?! For about the cost of a one time print ad you could have a powerfully dynamic real estate website online 24 hours a day seven days a week 365 days a year generating better business for you and helping you move more real estate! So you’ve finally put away the walk man and stopped tight-rolling your jeans and decided to jump on the social media band wagon. While it’s never too late to get started making changes for the better, if you are just now getting started you are already behind the game. It is therefore important that the content you are putting out there be as strong as it can be. For those brave souls daring the universe by taking their own social management in hand (the way honestly, it should be) there can be a long, confusing, and often frustrating road ahead. We’ve gotten a little too used to instant gratification online; sadly getting results from your search engine optimization and social media marketing is very rarely an instant process. One of the most effective ways to improve traffic, share information, and get better search engine visibility is through blogging – this is especially true when you syndicate your blog to other profiles like a Facebook Fan Page. With blogging, much like anything else, there is a vast difference between simply doing it and doing it well. Here are some tips to help you write a better real estate blog…again. 1 – JUST having a blog or social profile doesn’t DO anything. There is no set it and forget it in social media unless you are paying someone to do it for you. If you are not putting content into your blog on a regular basis, or interacting on your social profiles you may as well not even have them. There’s nothing that looks worse than visiting a blog or social profile and seeing “Last Update March 11,2009”. 2 – A single sentence, link, photo, or paragraph does not a blog make. Writing just a single sentence or posting a photo by itself as a blog “post” really isn’t going to help your search engine standing much. By posting one liners like this you kill your blogs power to create more keyword density, and to provide any kind of value to your visitor. 3 – Write well. Write frequently. This means actually writing your own content. This does not mean copying and pasting a blog or news article from some other source (even if you credit the author) – this means actually typing out the words that come from your own mind. It’s fine to reference outside sources, and even link out to them, but make sure you have at least a couple solid paragraphs of your own creation there to back them up. The next step is to write frequently – the more often your blog is updated the more frequently search engine spiders will visit it looking for new content. 4 – Keywords Keywords Keywords. Did I say Keywords yet? Frequent blogging is great, and key to gaining better exposure, but chances are if you are guilty of #2 and #3 you’re probably not putting any keywords in your content either. Keywords are the words or phrases you want people to type into a search engine to find you – by including them in your text content you increase the level of relevancy search engines give you for those words. So it’s important to have them somewhere in your text. Don’t over stuff your posts with them, but make sure they do show up. 5 – Tag em and bag em. If you are on the WordPress blogging platform, or if your blog supports the use of TAGS and CATEGORIES make sure you use and include these with every post; make sure they are relevant to the content you are creating and your keywords. By using tags and categories (which generally appear with each post) you don’t have to worry as much about including keywords in your blog post text; these elements provide great organizational abilities so that visitors can find information on the specific topics that interest them. Once you’ve got these details down you can do other things to help your blog gain exposure like submitting it to sites like Digg and StumbleUpon. There are also any number of social networks out there that let you publish blogs on their systems as well, so take what you’ve blogged, write a short intro for it and then link to it from those other sources as well – like Merchantcircle, Activerain, and LinkedIn. Still have questions about writing a better real estate blog? Just don’t have time to blog on your own? Either way we are glad to help out – contact us and let use know what we can do to be of service! 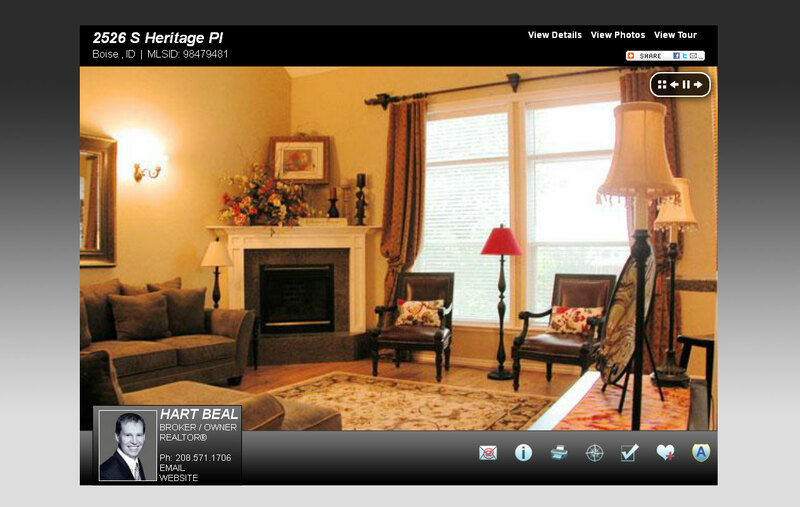 Our virtual tours are getting a new look! As part of a major new development at Tour Real Estate we have released an initial beta version of our coming virtual tour window. This beta release features a larger photo format, more refined screen layout, and search engine optimized coding for optimal web presence. Tour Real Estate customers can check out this sneak peek by logging into their client toolbox and posting photos for their listings in the Photo Tour section. The photos you post there will replace the ones from MLS on your website with us in this exciting new format! Future developments for this project include fully customizable looks to brand your tour window to you, youtube movie publishing from the photos you upload, music support, and automatic virtual tour creation of your listings as they hit the MLS! Stay tuned to this blog for developments as they occur and in the meantime feel free to contact us if you have any questions! Want the Best Realtor Websites Online? Tour Real Estate Realtor Websites are proven to be highly search engine visible and excel at generating leads to help you move more real estate! Listings are automatically added from your MLS, saving you time! Hassle-free custom page system lets you create an unlimited number of pages to showcase developments, events, or other items. We give you all the tools you need to create a powerful online presence; we’re developing more every day! ALL of this and more is available for about the cost of a one time print advertisement. Contact Tour Real Estate Inc today to find out how we can help you start the New Year off right! Just because you have a template website doesn’t mean you’re at a disadvantage – especially if that template website comes from Tour Real Estate Inc. We have over 50 different looks from you to choose from, most in several color themes, giving you the opportunity to choose a look that suits you. ALL of our template websites can be modified by our users to be more effective in search engines; by putting in just a little extra time you can gain a competitive edge on your competition. 1 – Meta Tag Administration. By going into this section of your toolbox you can control the title,keywords,and description for nearly every page on your site. Follow the guidelines described here to learn more about properly entering meta-data. 2 – Add Alt-Tags. If you website template uses our homepage modules go into the Customize Your Homepage section of your toolbox and edit the modules you find there. Under the edit function for each module you will find a space for “alt tags”. Enter link relevant keyword text in this space. 3 – Edit your homepage text. Under your Personal/Team/Office settings you can enter a few paragraphs of text – make sure it is keyword rich. In addition go in and edit the text on all of the default homepage modules, by entering your own unique and keyword rich text in these spaces you will help your website stand out to visitors and search engines alike. 4 – Social Links. Go to the social links area in your toolbox and enter the URLs for any social networks you may be active on. If you do not have accounts on these social networks it is a good idea to create them and become familiar with using them. 5 – Get More Links. How many links from outside sources point to your website can be a big factor in it’s search engine visibility. Therefore it is a good idea to have as many links as you can pointed to you. Make sure all your social profiles have links to your main website on them, get friends who have websites to add a link to your site, comment on other websites/blogs and include a link, enter your links on any of the hundreds of free directories online. It is best to only exchange reciprocal links with other websites of high quality but ANY link pointed to you is better than none at all. The Link Exchange section of your toolbox will allow you to easily create, edit, and manage your link exchanges with other sites. These are just a brief Top 5 things you can do to start improving your templated REALTOR website. There are any number of other things that can be done to help promote your digital presence; we’re always glad to talk with our REALTOR website clients to see how we can help them make the most out of their websites with us. We aren’t going to blow a lot of smoke and tell you that your website will change your world, but it CAN be one of your most valuable and cost effective marketing tools – and when it comes down to it a real estate website is just that, a tool, if you use it you will see results, if you don’t it will lay there and rust. Contact Tour Real Estate today if you need help using your website with us, or if you are a real estate professional looking for a highly functional and powerful web presence.